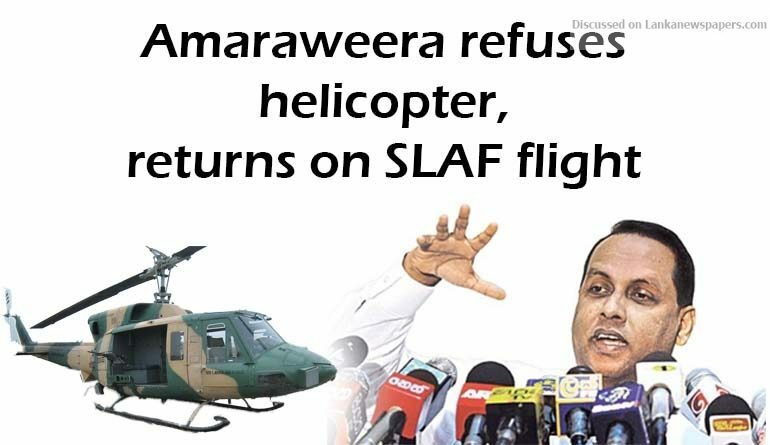 Fisheries and Aquatic Resources Development Minister Mahinda Amaraweera, who had refused a private helicopter, had returned on an SLAF routine flight this morning from Palali, Air Force Spokesman Capt. Gihan Seneviratne said. The pilot of the private helicopter, which carried the Minister yesterday to Palali, had reportedly lost way to the runway and had been airborne for over 45 minutes searching for the Palali runaway to land. Speaking to the Daily Mirror, Air Force Spokesman Capt. Gihan Seneviratne said that the Minister had come to Palali to attend a Thai Pongal function, however had requested the support of the Air Force following the incident. Capt. Seneviratne said the Minister returned to Colombo this morning via a scheduled flight as he refused to travel in the same helicopter. He said Ministers had air travel privilege only with the consent of the Ministry of Defence (MoD). “Some media is attempting to tarnish the Air Force image using the incident. Ministers can use the Air Force aircraft with the consent of the MoD. We brought the Minister back using a scheduled flight from Palali to Colombo and there is nothing unusual in this,” he said.